Meet Anny Fodor! She is one clever woman. There’s so much information here about her and a delicious recipe – I’m going to hand this one straight over. Let’s get into this and be inspired by this wonderful human. Tell us about your journey to where you are now. I feel touched by life. I grew up in Melbourne in the 80’s and 90’s. Following a challenging childhood I was blessed to find yoga, meditation and soon after shiatsu and macrobiotics, all at the tender age of 17. Needless to say I was called a hippy. I went on to study drama and spent some years training and performing Butoh (Japanese avant-garde theatre) while working in the theatre industry. What was a passion next became a career move when I bought a share in a small café in St. Kilda, Wild Rice. It was the first macrobiotic vegan café in Melbourne. 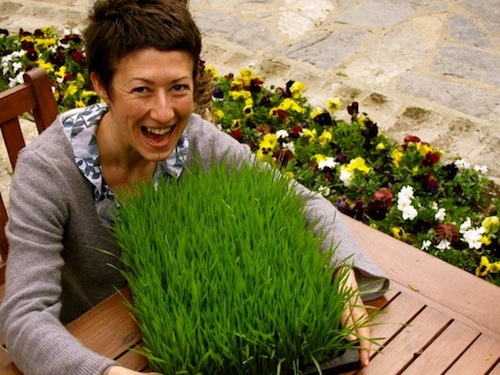 Having a café enabled me to explore my passions of food, healing & performance. But something else was missing. On my 30th birthday I decided to sell up and find my European roots. My father being Hungarian was another aspect of my life I needed to explore. I stayed in Hungary a few months before visiting friends in Turkey. I planned to visit for the Summer and stayed 10 years! I was welcomed with open hearts; the people, the food, the sun, the landscape and fresh local produce. I was seduced by the traditions of ancient village wisdoms and the expanse of cosmopolitan Istanbul. I was fortunate enough to apply my shiatsu and food preparing skills as the healing and spa industry was growing there too. I opened my own raw wholefood café as well as a cleansing retreat centre while consulting on other café menu’s and coaching clients around nutrition and lifestyle. For personal reasons I have recently returned to Australia and followed my heart to Hobart. I accomplished what I set out to do overseas and am now enjoying the process of integrating my life experiences on home soil. I feel this is the beginning of the third phase in my life. I am very close to officially launching my coaching business here in Australia. I am currently based in Hobart but work internationally with clients on Skype. As I grow and develop I find Happiness to be more of a choice, a state of mind, and most often when I choose to be grateful. Being thankful for what I have gives me a sense of place and balance. It is far too easy to be unhappy with those common, almost addictive thoughts of not enough or not good enough. I am grateful for the time I can be with people I love, truly thankful for when I am able to pick food off trees and right out of the ground, when I see beauty, when I feel beautiful, when I am able to experience peace, when working up a sweat, when preparing food and of course when sharing with family and friends. Rather than being something to work at, I’m finding happiness is more about allowing it to be. Why do you love TCM so? I love knowing that only recently with improved technology we are able to see into the human body and witness energy running through our meridian channels. Previously we were only able to see the internal body during autopsy procedure, when of course at death energy stops running. This proof has given many western doctors the confidence to study this ancient system and hopefully will be our healing basis for a further 5,000 years. Where’s the best place you have ever lived and why? I have been fortunate to live in a few countries and have taken learning’s and gifts from each in their varying cultures, but Turkey has been my biggest influence. I particularly loved the depth of its food culture. Food was of the highest quality, fresh and in abundance. I never ate alone and was so often given jars, tubs and bottles of preserves, pickles, cheeses, yoghurt, kefir, honey, pollen, olives, olive oils and prepared dishes from the proud makers in their kitchen or independent farm based workshops. Food brought people together and was always shared. If there is something I would suggest to young people, it would be to travel, learn another language and experience other cultures. It’s a spiritual experience. Most rewarding part of your job? As a mature woman I have spent the most part of my life on a quest for continuous self-improvement. It is an honour to now share my own knowledge and experience and be a part of this ever-expanding world of wellness. In a relatively short amount of time I have watched the paradigm shift from being alternative hippy’s to a multi million dollar industry and growing. The revolution is here and now. I believe the most powerful thing we can do in life is empower ourselves and each other. That right there is my job. I get paid to feed people the goods to grow, to empower and initiate greatness in their own lives. Everyday I am reminded that by giving ourselves what we truly need, weather it is feeding our heart or soul or belly the rest is taken care of. Shower the roots and soil and watch it blossom and fruit. I take pride in watching my clients striving forward with improved health and vibrancy which flows into all areas of their lives and ultimately people around them, health and wellness is contagious and I love spreading it! Is having a happy belly limited to food do you think? I created my HappyLife program with the modules: HappyBelly HappyBody HappyMind as simple groupings to address my clients needs. I needed a simple approach to address our more complex issues. HappyBelly for example is chiefly concerned with food and digestion but if you have a broken heart or your body is in pain it doesn’t always matter what you eat. One of my clients had a serious digestive issue but did not respond to specific dietary changes that had otherwise been effective. The more we worked, the closer we came to the root cause of her dis-ease. Once we began to heal her heart, her digestive issues cleared up. Her new-found freedom from belly pain has inspired her to write a book to share her profound insights between body, mind and heart. What’s your happiest recipe (for good gut function)? A gut full of friendly bacteria is a happy gut. Donna Gates says that our digestive systems are intimately linked to our immune, endocrine, circulatory and central nervous systems. Basically our over all well being and very much related to our mental health. It’s wonderful to see this explosion of information around cultured and fermented foods due primarily to their good gut bacteria building. In every culture around the world since the beginning of life, we find fermented foods. Eating and drinking fermented foods and liquids may just be the panacea our current health crisis is asking for. Today I would like to share a recipe using one of my favourites on the long list of fermented foods, Miso. I often simply dissolve a teaspoon of miso in hot water and drink it as tea during the day. It’s warming, calming and very grounding. It is also a great addition to sauces, dressings and cooked dishes. The trick is to add a little hot water to activate the enzymes but do not boil as it destroys them. Cover and cook for a further 30 – 40 mins depending on how well the vegetables cook. You want the vegetables to melt in your mouth. Now comes the miso. It is important not to add the miso to the cooking pot. Boiling miso destroys the goodies. Put a few tablespoons in a bowl or mortar or surabachi (Japanese mortar) and add some hot soup water to make a paste. Add one or more spoons of miso paste to your soup at service and top with fresh herbs. Tips: A). 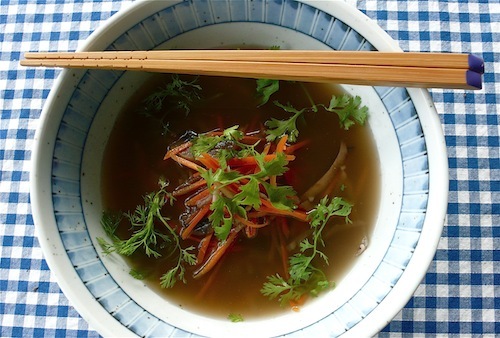 Use darker colour miso for colder weather and lighter colour miso for warmer weather. B) I have been able to find fresh turmeric more often in Asian grocery stores. In Melbourne the fresh produce people in Glen Eira Rd and the Asian grocery behind Coles, in Prahran both often stock it. A native Australian with a vast knowledge in wellness and health, Anny Fodor has been studying and practicing the healing arts of zen shiatsu, yoga, chi-gong, macrobiotics, raw and living foods & Buddhist meditation across the globe for the past twenty-five years. A qualified Holistic Health Coach, with a diploma in Holistic Health Coaching from The Institute of Integrative Nutrition of Columbia University, New York City. Anny is motivated by the ever-expanding data of modern vs. earliest dietary theories, fusing Asian philosophy, mind body somatics and integrative medicine. Her compassionate nature, playful personality along with her cutting edge skill set provides for a high quality, fun and unique educational experience.